The state funeral for former President George H.W. Bush featured heartfelt tributes, including a tearful farewell from son, former President George W. Bush. The grand and solemn service at Washington National Cathedral was also punctuated with moments of laughter. See videos of all the tributes. 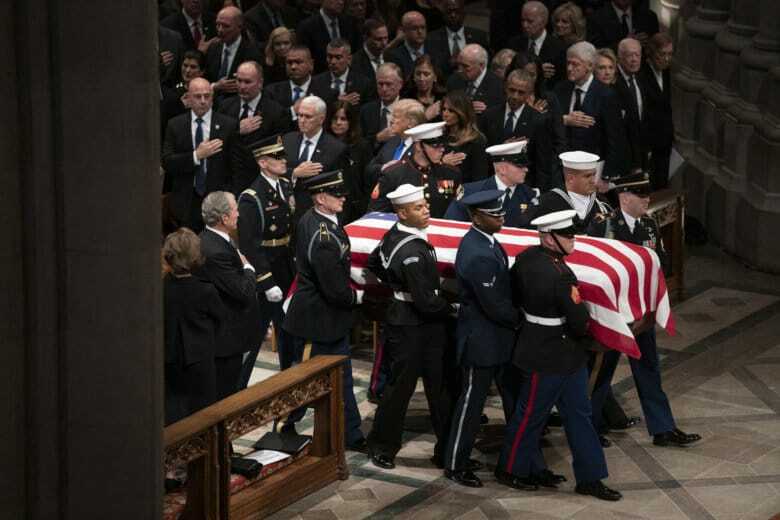 WASHINGTON — The state funeral for former President George H.W. Bush featured heartfelt tributes, including a tearful farewell from son, former President George W. Bush. The grand and solemn service at Washington National Cathedral was also punctuated with moments of laughter. Former Wyoming Sen. Alan Simpson drew laughter from the crowd with his folksy tribute to the former president’s sense of humor. “He had a very serious flaw: He loved a good joke … But he never, ever could remember a punchline,” Simpson said. Watch all of the tributes to President George H.W. Bush below. Former President George W. Bush gave a tearful tribute to his father. Alongside a few moments of humor, former Republican senator from Wyoming Alan Simpson eulogized Bush’s character: “He often said, when the really tough choices come, it’s the country, not me. It’s not about Democrats or Republicans, it’s for our country that I fought for,” Simpson said.